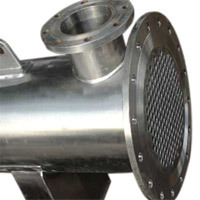 We are one of the major manufacturers and exporters of Heat Exchangers in the market. Fabricated using the best quality raw materials our Heat Exchangers are highly efficient providing flawless lifelong services. Extremely strong and corrosion resistant our Heat Exchangers are in huge demand in the market.